The M13VM246 is our wide-angle vari-focal lens for Megapixel cameras. With a focal length of 2,4mm you can reach a horizontal angle of view of over 111° with 1/3” cameras. As in our M13VM308 lens, we use hybrid aspherical lens elements to achieve a constant high resolution up to the corners of the image at the fastest F-stop. 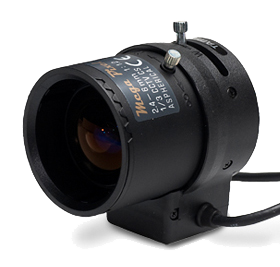 The M13VM246 also features a wide focus adjustment ring of 240°, as does our M13V_308 model. With this attribute, the focus can be adjusted fast and precisely in every situation.